"This recipe is always a real hit! Every time I make these I get asked for the recipe. People can't believe it when I tell them that they're made from winter squash. 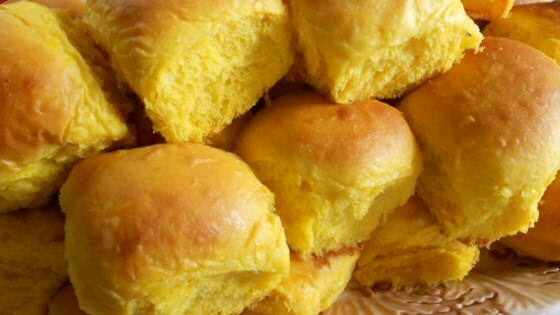 These delicious rolls taste best fresh out of the oven." Preheat oven to 400 degrees F (200 degrees C). In a small saucepan, cover squash cubes with water. Bring to a boil and cook until tender, about 15 minutes. Drain, cool and mash. In a small bowl, dissolve yeast in warm water. In a large bowl, combine 5 cups flour, sugar and salt. Stir in the yeast mixture, shortening, squash and milk. Mix well. Stir in the remaining flour, 1/2 cup at a time, beating well after each addition. When the dough has pulled together, turn it out onto a lightly floured surface and knead until smooth and supple, about 8 minutes. Lightly oil a large bowl, place the dough in the bowl and turn to coat with oil. Cover with a damp cloth and let rise in a warm place until doubled in volume, about 1 hour. Divide the dough into twelve equal pieces and form into rounds. Place the rounds in a lightly greased 13x9 inch baking pan. Cover with a damp cloth and let rise until doubled in volume, about 30 minutes. Bake at 400 degrees F (200 degrees C) for 10 to 15 minutes or until golden brown. Discover all the different ways to prep and cook winter squash. Moist,light,tasty and a wonderful golden color if you use butternut squash.I baked at 375 degrees for 30 min.They tend to over brown at 400 degrees.I got two large pans(32 rolls)with this recipe. Very moist and soft bread. My mother wanted seconds of it instead of dessert at Thanksgiving dinner. Very good recipe.